@Rekon there is also multiple large networks such as hypixel and badlion that now offer competitive events (even some with small cash prizes) plus I could host competitive events and I would be willing to run sign ups to get people interested in competing! I have so many ideas on events and comp. And I already have ideas for badges we could have! We do look forward to its return to TAW if interested fill out the vanguard interest form as rekon posted above if we get enough interest maybe it will return. That's very admirable of you. At the current time, it isn't needed. As it stands, this forum thread is an interest post to generate interest in the game. Vanguard assesses the interest based on people filling out the Vanguard Interest Form. We then get to see how many people are willing to transfer into the game to help spin it up. Typical Spin Up Team: 1x SUL, 1 EU SO, 1-2 EU DI's, 1 NA SO, 1-2 NA DI's (1 HDI per Battalion is optional for initial Spin Up). Vanguard holds the rights to make a Division a Joint Battalion Team which would comprise of 1x SUL, 1x SO, 1-2DI's. But our standard is separate Battalions. As several have stated, first step is for those who are interested in being part of this potential unit, to fill out the Vanguard Interest Form. After that, should there be enough interest, Vanguard staff d3ems whether the game is suitable for TAW (in this case, to come back to TAW) and if so, conducts interviews with whom they feel, are the best candidates for the spin up team. 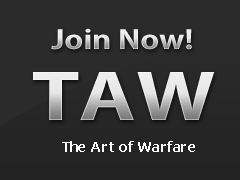 There is a play channel and a server in the channel description that we currently have about 10 TAW members playing on! The channel is at the top of Vanguard under "game testing channels" it has been getting more active recently"